Because of the importance of the lineage and the relationship between living members of the family and their ancestors, preparation for the afterlife was of great consequence to the Chinese. During the Ming dynasty and earlier centuries, the tombs of the Imperial family and high ranking officials were filled with a splendid array of objects and textiles to be used by the tomb occupants in the next world. The 1950’s discovery of the entrance to the Dingling Tomb of the Wanli Emperor near Beijing, and its subsequent excavation, provided testament to this belief. 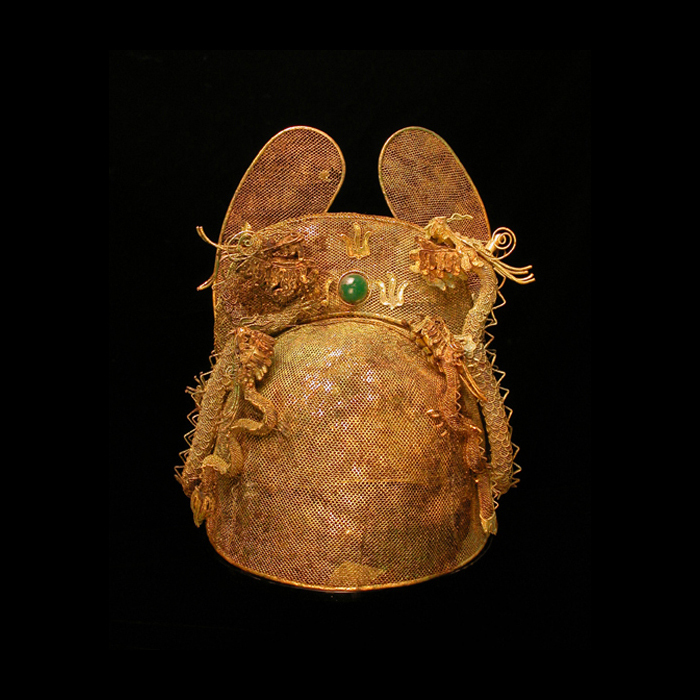 The tomb contained over 400 garments and fragments of dress, together with over 600 specimens of silk cloth jewelry, and many imperial artifacts, all placed there to accompany Wanli, his wife, and the mother of his son to the next world. Its discovery was of immeasurable value to the understanding of Ming court costume. The shape of the present gilt mesh crown is based upon court headgear of black lacquered gauze with two upright wings. However, this crown was intended to be worn on formal state occasions and as such was designed to convey the importance of the position and power of the Emperor to the Court. 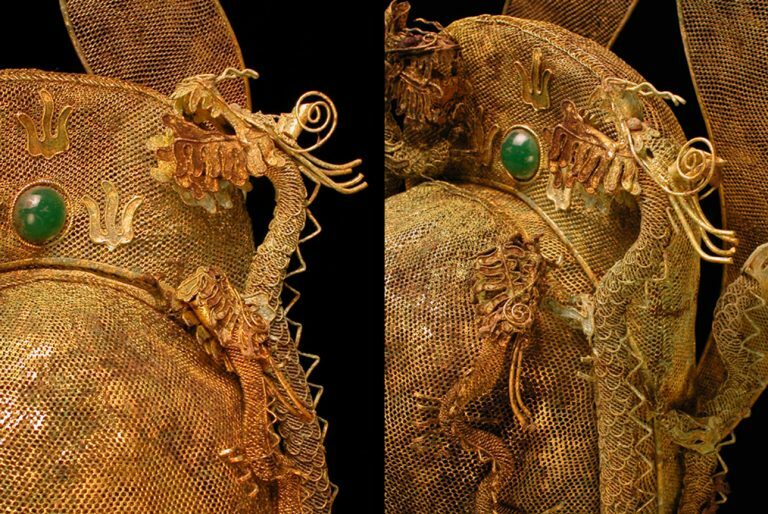 The crown shows two gilt gold wire formed dragons opposing each other confronting a flaming pearl of knowledge. The pearl consists of a cast glass bead of emerald green color emulating jade, the bead is of brilliant translucency. There are two wings consisting of gilt gold wire mesh attached to the back of the crown. In our opinion, the workmanship, design and subject matter of this gilt gold crown is an outstanding example of the Ming period, and as such is a significant cultural object. A similar crown is illustrated in Chinese Archaeology – New Perspective of on China’s Past from the 20th Century by Xiaoneng Yang Editor. Yale University Press, London, 2004. Volume 2, Page 547. Another gilt gold mesh crown excavated from the tomb of the Wanli Emperor at Dingling is published in Chinese Clothing, An Illustrated Guide by Valerie M. Garrett, Oxford University Press, Oxford, 1994. Page 7, Figure 1.7, and on Page 139.